I call this a summer Caesar because the tomatoes are so good now, I have to include them on the plate. After playing around with a couple of different dressing recipes, I came up with this one. I can’t get past the ick factor of eating raw eggs, so my version uses mayonnaise. I always use Hellmann’s light mayonnaise, but use what you have. No Miracle Whip! The Tabasco adds a little zip and the fresh lemon makes it bright and flavorful. 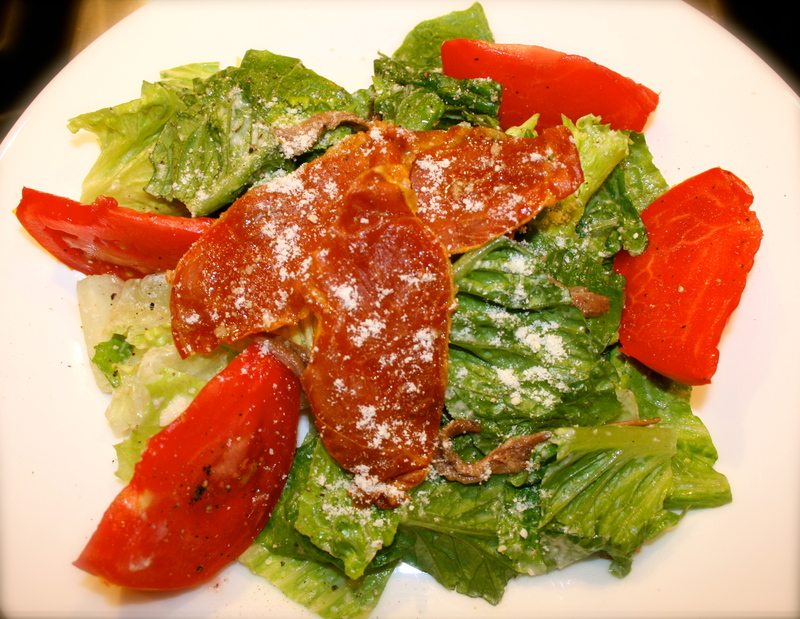 I top my Caesar with a tower of crisped prosciutto slices and garnish with juicy wedges of summer tomatoes. Don’t forget the anchovies. Place all the ingredients in a food processor and blend. Thin the dressing with a little more water if it’s too thick. Save remaining anchovies from the tin for the salad. Leftover dressing will store in the refrigerator for a few days. You won’t need it all for this salad recipe. Lay prosciutto slices on a baking sheet lined with foil. Place in oven for about 6-8 minutes or so, until crisp like bacon. Lay on a paper towel to drain when done. It will crisp up more as it cools. To make the salad, cut romaine and toss lightly with some of the dressing. Top with anchovies, additional parmesan cheese, freshly ground pepper and stack the prosciutto on top. Garnish with tomato wedges around the salad.